Calls have been made for a roundabout to be installed on Commercial Road at the Albert Road junction. Stuart Beck, of Buccleuch Road, raised the issue with members of the Teviot and Liddesdale Area Locality Committee at a meeting last week. He said: “There is that much traffic which is coming along Commercial Road over Burns Bridge and you can’t see them indicating so you can’t pull out. It is just a traffic jam. Hawick and Hermitage councillor, George Turnbull, replied: “Years ago there was mention of a roundabout there but cost was one of the elements why it was knocked on the head. It could be worked. He argued that with the opening of the distillery and the Aldi supermarket, the potential increase in traffic would possibly strengthen the case. 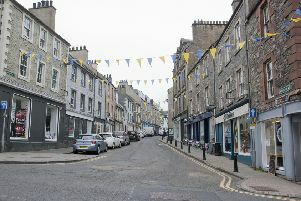 Ian Turnbull, chair of Hawick Community Council, said: “This is a great idea in principle. As a member of the A7 Action Group, I am in favour of anything which primarily increases safety and secondly which reduces congestion. “The junction concerned is certainly a bottle neck at times. However, he warned that there could be problems ahead, with the first being Transport Scotland and Scottish Borders Council working closely. The A7 Action Group will discuss it at its next meeting.